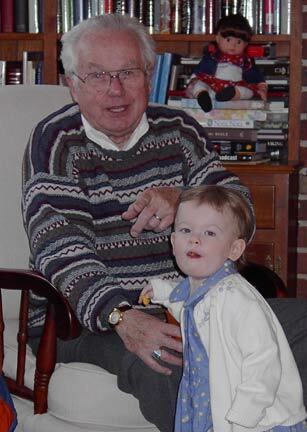 This past Tuesday, Pete's dad passed away. He had been battling cancer for almost three years (although the doctors thought he would only have 6 months!) and we were lucky to have so much extra time with him. He died at home and Pete was able to be there to say goodbye. Saturday there was a memorial service for him and a nice dinner following. Afterward we went back to Pete's mom's house and a house packed with friends and relatives looked through photos into the evening and shared lots of stories. He loved well and was well loved. He has been like a second father to me and I already miss him. I couldn't sleep, so I was up taking pictures of the snow. I think this is my favorite. 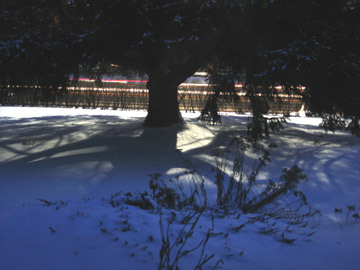 It was taken just as the sun was rising, which accounts for the bright blue glow. I know my limits. . . Anyway, I actually slept well last night. I haven't been sleeping because I've been upset about Pete's Dad, who has been fighting cancer for almost three years. We have been very fortunate to have the extra time with him, but I'm afraid that we may not have much more. It's very difficult to write about, so I'll leave it at that. And there is also good things going on. My sister is getting married in March, and that means that I have been busy with all the usual wedding stuff. The shower, dress fittings, buying gifts, finding something to wear to the shower, etc. . . You get the idea. And there is work. It's one of my busy times of the year (although Pete will tell you that there is really no slow time anymore) and some nights I am working until 11pm. Oh, and don't forget the Knitting Blogs Web Ring! I've been spending way too much time on that. And it's the one thing that I can easily cut my time on. After all, it's my ring and I can do what I want with it. As a result, I have closed it. I'll re-open it now and again. Probably on a whim. And when it starts to annoy me and eat up my time, I'll close it again. So, this morning I read a book to Maddie and I'm looking forward to doing a little work and then trying to relax with a little knitting this evening. Tomorrow we are off to see Pete's Mom & Dad up in Cary and Sunday is the bridal shower. It looks like it's going to be a busy (and possibly stressful) weekend, but I'll get through it. Well, we had our first Joliet Area Knitting MeetUp last night. Although there were only three of us in attendance, I would say that it was quite successful! I had a wonderful time chatting with Cathy & Mary. So wonderful, in fact, that I got home later than I thought I would. When I left the house, I told Pete that I would probably be home in about an hour. I didn't actually get home until over two hours later. If you live in the greater Joliet, IL area, we would love to have you join us for next month's meeting! 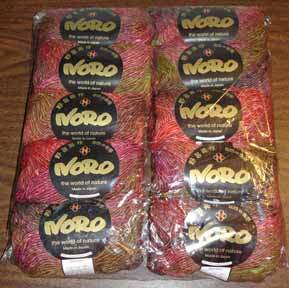 Well, I opened up the Knitting Blogs Web Ring for new members again. And I'm about to close it. It drives me crazy when I spend 2 hours on the ring and add only 5 sites. Why two hours today? Because no one reads the rules, or they do and join even though they don't meet my requirements. And this two hours doesn't even count all of the emails that I answer throughout the day. sigh. Spending all of this extra time on the ring is also cutting into my knitting time. I've been very busy with my rubber stamp store -- Stamping Online -- which is leaving me with little free time as it is. 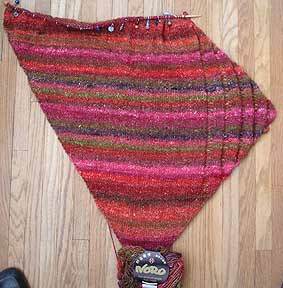 So, Clapotis only increased by a few rows in the last week. Maybe she will get some attention tonight at the Joliet Knitting MeetUp. I am the group's organizer and this is our first meeting. If you are in the Joliet area, please stop by the cafe at the Barnes & Noble out by the mall! Unhappy with the Bush administration? Stop by this post on Pete's blog and find a way to make your spending dollars count! Me: So how old is Zach Braff? Pete: I don't know. Why? Me: Because I think I have a crush on him. Pete: (turning to me with a very serious look on his face): I think *I* have a crush on him. Lol! The move was excellent and Braff wrote, directed and starred in it. How could you *not* have a crush on this guy. Just brilliant. And for all of you who come here for the knitting content -- which has sadly been quite pathetic as of late -- I actually have a photo of my Clapotis! Now I'm off to play The Legend of Zelda: Minish Cap. 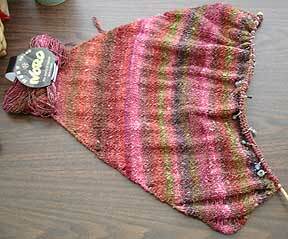 First Finished Item of 2005! Pete's Trekking sock! Sock, you say? 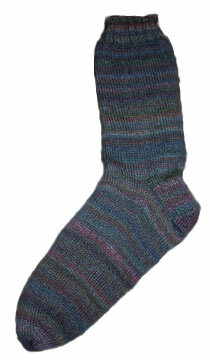 Now how on earth could I call this the first *finished* item of 2005 when it is only a single sock? Well, I'm calling it one anyway, darn it! I've been injured! I feel like it is quite an accomplishment given the circumstances. I even started the second one. . .then the new year hit. New year, new project, right?